’Tis the season—of contractions like ’tis, of goodwill, of gift giving, of merriment, and, of course, of tradition. 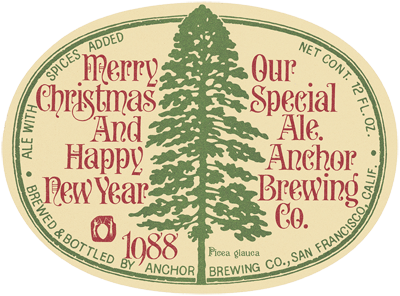 At Anchor, we’ve been celebrating the season with a longtime tradition of our own called Our Special Ale (also known as Anchor Christmas Ale). New recipe. New tree. New label. Every year. 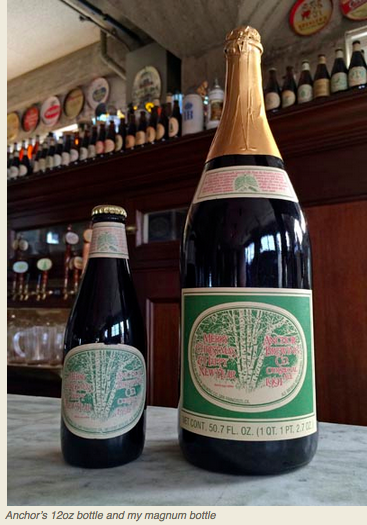 And, since 1991, a new bottle alongside the traditional 12-ouncer: the 1.5 liter (50.7 ounce!) magnum. Anchor years are the opposite of dog years, so 1991 doesn’t seem so very long ago. Terminator 2: Judgment Day (“Hasta la vista, baby”) was tops at the box office. Silence of the Lambs (“I do wish we could chat longer, but… I’m having an old friend for dinner.”) took the Oscar for Best Picture. Iraqi forces were forced out of Kuwait as the Gulf War came to an end. The Dow Jones Average topped 3,000 for the first time, finishing the year at 3,168. Nirvana released its Nevermind LP. Seinfeld debuted. 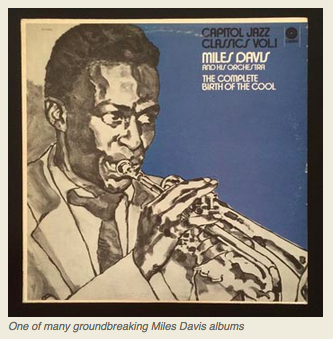 Miles Davis, Dr. Seuss, and Freddie Mercury died. At Anchor in 1991, Fritz received an unusual Christmas gift, a magnum of sparkling wine from fellow vintner Jack Davies, whose Schramsberg Vineyards was already well known for its effervescent creations. “I always admired Jack and visited Schramsberg early,” Fritz recalls. “He started in 1965 too, I think, and I sold him grapes for some of his first harvests. We had to pick in boxes for him (! ), which was by then becoming very rare. His truck had a flat tire, which we fixed for him. Very amusing. 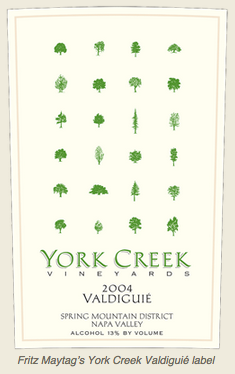 And Napa Gamay grapes for his rose champagne.” Fritz would later make a York Creek Valdiguié (AKA Napa Gamay) in his winery across the street from the brewery. Fritz could have just sent a 6-pack of Christmas Ale to Jack as a thank-you gift but that is not Fritz. He had a better idea. 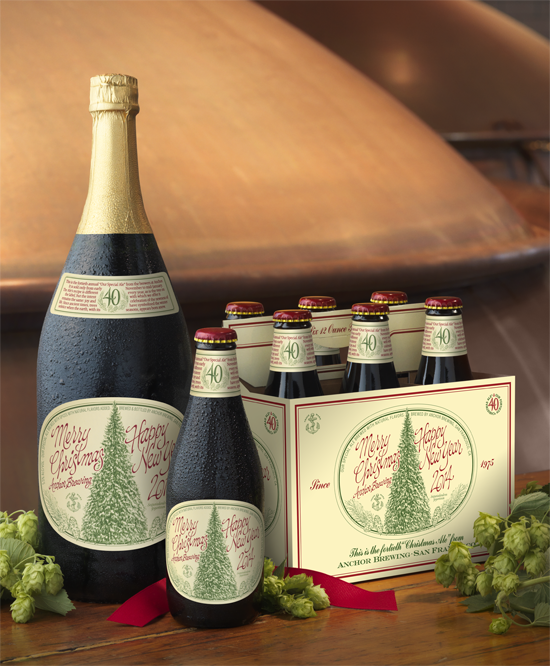 What if we were to bottle a little of our 1991 Christmas Ale in magnums so he could surprise Jack with a bottle and return the favor in kind? It wasn’t easy, but we did it. 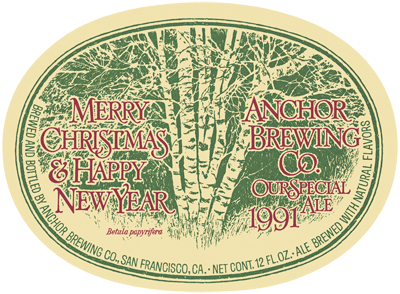 I’ll always remember the tree on our 1991 label (a birch), because that was my first Christmas Ale as a member of the Anchor family. On December 12, we bottled 103 magnums (the goal was 100, but we had a couple extra bottles) off a keg in the cellar. 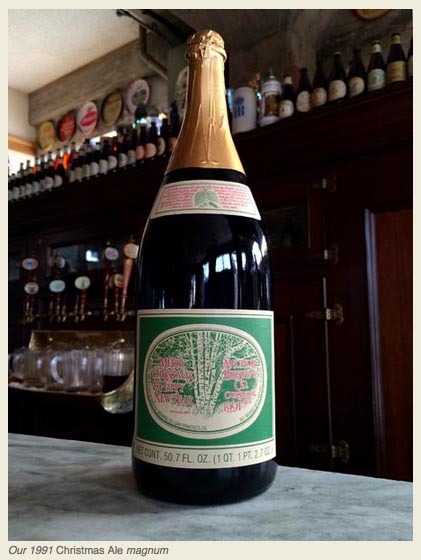 At that time we did not yet have a bottling line that could handle this huge bottle, which is twice the capacity of a standard wine bottle and super heavy to accommodate the pressure of méthode champenoise sparkling wine. I was a young bottle shop/racking room/cellar/tour guy at the time so Fritz asked me how many magnums I thought I could sell on the tours that day. I remember saying something like “How many would you like me to sell?” Fritz smiled. Fortunately for me and for the brewery, I hit his number (it was easy—they were beautiful), which included selling one to myself. I still have that bottle today, kept unopened all these years! The next year, Fritz asked me what I thought would be a good bottling number. 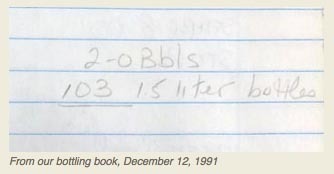 We agreed on 1992 bottles for 1992. 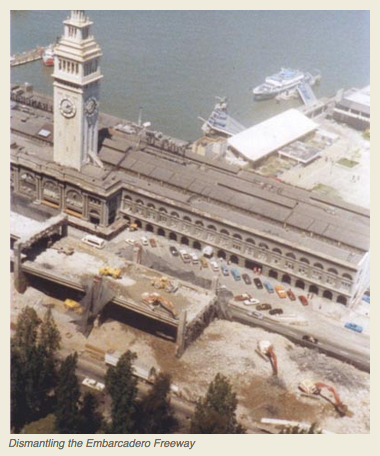 The following year (1993) we did—you guessed it—1993. Needless to say, this was a great idea that was not a good idea. The curve we were plotting for sales was as flat as bad beer! Finally, in 1994, we had a bottling line that could handle magnums. Fritz again asked me what I thought. I thought we could sell 10,000 and whether that was the number he already had in mind or not, we bottled 10,302 that year. Besides being a great gift, a magnum bottle is symbolic of an ancient ritual, that of sharing beer with fellow brewers (or vintners—it takes a lot of beer to make wine! ), friends, and family. Long before the Wassail bowls of medieval England, there were the beer jugs and straws of ancient Sumeria, from which early brewers could share the fruits of their labor. 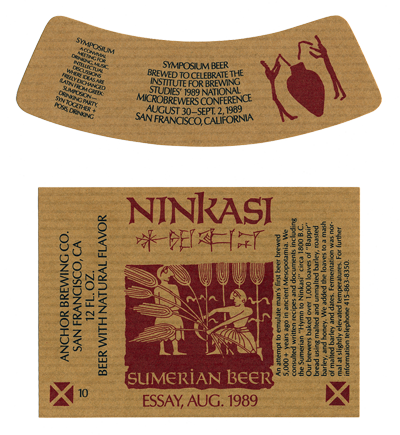 We included a small pictogram of this scene on our 1988 Christmas Ale label, foreshadowing our 1989 re-creation of an ancient beer we called Ninkasi. But that is another story. So this year, before they’re all gone, find a magnum near you (they’re searchable on our new Beer Finder) to enjoy with your friends and family over the holidays! And all our best for a cheers-ful season!